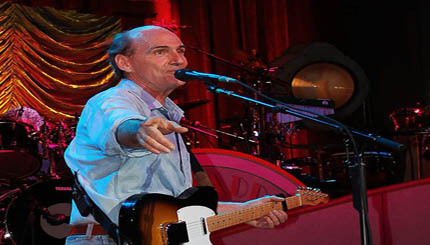 James Vernon Taylor (born March 12, 1948) is an American singer-songwriter and guitarist born in Boston, Massachusetts, and raised in Carrboro, North Carolina. He owns a house in the Berkshire County town of Washington, Massachusetts. A five-time Grammy Award winner, Taylor was inducted into the Rock & Roll Hall of Fame in 2000. Taylor achieved his major breakthrough in 1970 with the #3 single "Fire and Rain" and had his first #1 hit the following year with "You've Got a Friend", a recording of Carole King's classic song. His 1976 Greatest Hits album was certified Diamond and has sold 12 million US copies. Following his 1977 album, JT, he has retained a large audience over the decades. His commercial achievements declined slightly until a big resurgence during the late 1990s and 2000s, when some of his best-selling and most-awarded albums (including Hourglass, October Road and Covers) were released.